Macro Wizard Keyboard Mouse Recorder lets you record and play back keyboard and mouse actions. 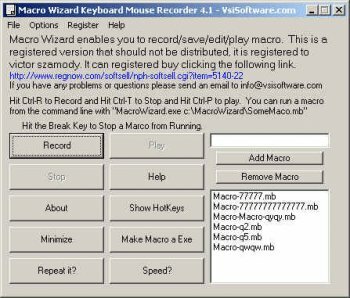 Also has Hot Keys that enable you to Run Marcos, Run Applications, Send a string a text, Send Key Strokes too. This was the most disappointing shareware I have ever tried in many years. The first thing I noticed (red flag) was unlike most professional products, there were no system requirements mentioned, even on the company's website, for example about which versions of windows are supported, and the dates and reasons for the updates to the software. You WANT to see this, as it shows you are paying for software that will continue to be supported, rather than paying for "dead" software that will stop running at some point due to windows compatibility issues in the future. I learned later that Version 4.1 has been around for about 4 years now unchanged. What does that tell you? I started to get even MORE suspicious, when I attempted to Macro Wizard in Windows Vista, and I received an error message about a failure due to a failed registry update. NOW is where the real fun begins! The developer told me that the problem is due to a Microsoft issue and I should contact THEM about it! ANYONE who even THINKS of downloading this software after reading that statement is very naive or ignorant, because Windows Vista has been out for over 2 years, and after having installing hundreds of products of course NONE of them that I have tried that were developed for and supported Vista have had a problem like this. Want more? After I made changes to get it to finally install, I found that while Macro Wizard runs, it takes 50% of my CPU for the ENTIRE time its running. Nothing in the world of software besides photo editing and CAD design software even comes CLOSE to the CPU usage of Macros Wizard! My laptop fan runs at full speed the entire time Macro Wizard runs! Why is it taking 50% of my CPU when the program is merely running? It's not even running scripts? Why? Because the developers didn't even care to look at performance. As a former developer, I can tell you for a fact, this means the developers of this product are not professional or skilled. Last and not least, all my conversations with the developer over these issues were met with evasive and vague answers. As I mentioned before I was told it was Microsoft's issue that the product doesn't install clean in Vista. I received no answer on what versions of windows are supported or test. Also, No answer on the ridiculous CPU usage. However when I called to their attention the SEVERAL awful spelling errors in the product (again, what does that tell you about the professionalism? ), I was asked to supply examples! I guess I am now a tester for them? In closing, let me say that if you found this product, you can EASILY find similarly priced shareware that does all that this product does and MORE, AND are supported properly. I fail to understand why ANYONE would pay ANY money for this product. Now I don't doubt that FINALLY after seeing my review posted that they will try to fix some or most of these issues, but lets face it, if MY review was the only thing giving them incentive to put some effort and quality in the product, what does that say about them?? This is one very buggy piece of software. Running it on a windows Vista machine. Got my first error message when trying to install. Finally got it to install but kept getting error messages with almost everything I tried to do. Maybe this is just not suppose to run on Vista!!!!!!!! !